Humans evolved to the rhythms of the natural light-dark cycle of day and night. The spread of artificial lighting means most of us no longer experience truly dark nights. Like most life on Earth, humans adhere to a circadian rhythm — our biological clock — a sleep-wake pattern governed by the day-night cycle. Artificial light at night can disrupt that cycle. Our bodies produce the hormone melatonin in response to circadian rhythm. Melatonin helps keep us healthy. It has antioxidant properties, induces sleep, boosts the immune system, lowers cholesterol, and helps the functioning of the thyroid, pancreas, ovaries, testes and adrenal glands. Nighttime exposure to artificial light suppresses melatonin production. Exposure to blue light at night is particularly harmful. Unfortunately,most LEDs used for outdoor lighting — as well as computer screens, TVs, and other electronic displays — create abundant blue light. A 2016 American Medical Association report expressed concern about exposure to blue light from outdoor lighting and recommends shielding all light fixtures and only using lighting with 3000K color temperature and below. To minimize harm from blue light in your home, choose the right light bulb and download a color temperature app that adapts your electronic screen to the time of day – cool light during the day and warm light at night. F.lux is available for Mac OS/X, Windows, Linx and (jailbroken) iPhones and iPads. For those with Apple devices using the iOS 9.3 operating system and above, the Night Shift app is pre-installed. Click here to learn how to use it. Lux is available for Android devices free or for pay. Twilight is available for smartphones or tablets. 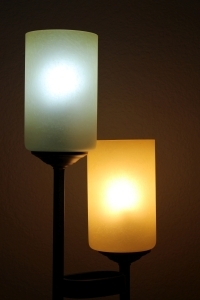 In the picture on the left, the bulb on the left is rich in high-color temperature blue light, while the one on the right isn’t. Be sure to look at the packaging. All packaging for new CFL and LED light bulbs provide color temperature information. Use low color temperature light sources for interior and exterior light. Their light is less harsh and less harmful to human health and the environment. Look for warm white sources with a color temperature of 3000K or lower. The Kelvin temperature chart below shows you what the numbers mean. Higher color temperatures mean bluer light, the kind that should be avoided after dusk. Read our Seeing Blue Report to learn more. Glare from poorly shielded outdoor lighting is also harmful to your health, because it decreases vision by reducing contrast. This limits our ability to see potential dangers at night. Aging eyes are especially affected.